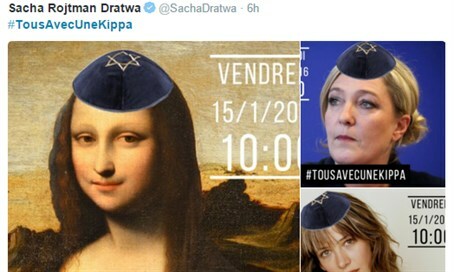 French Twitter posters use #TousAvecUneKippa along with pictures of celebrities wearing kippot in support of Jewish community. The French demonstration of solidarity with Jews has received its unofficial hashtag title: #TousAvecUneKippa, meaning "all of us with a kippah." The movement, which calls on people of all religions to wear a kippah this Friday, came about after the president of the Jewish community in Marseilles suggested that Jews stop covering their heads in order to avoid being targeted for attacks. People are now using the hashtag to post pictures of celebrities wearing kippot, whether real or edited. Zvi Ammar, the community president, told Arutz Sheva that his comments had been taken out of context, but he is happy to hear that many people throughout France are showing their support for the Jewish minority. Ammar is not the only person encouraged by the call for all French people to put on kippot. Chabad rabbis around the country are planning on distributing kippot to help the French show they will not allow attacks on Jews to continue unopposed.